Metal Earth ICONX models are larger in scale with more details. They are more challenging, and at the same time more satisfying, to assemble. 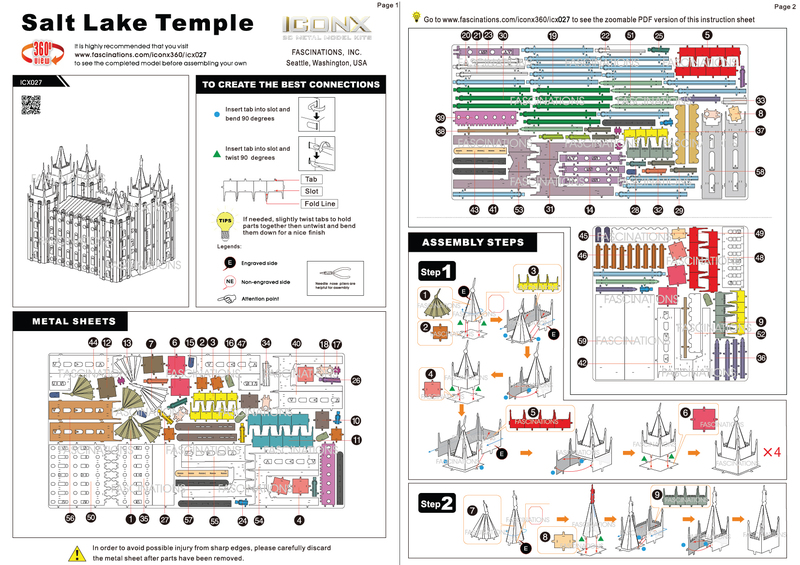 ICONX Salt Lake City Temple starts as two 4-inch by 8-inch, and one 4-inche steel sheets and finishes as a 2.91" x 2.4" x 3.58" 3D model. Simply use the easy-to-follow instructions included with the sheet to pop out the pieces, bend the tabs, and connect them at the attachment points. No glue nor solder required. PRODUCT FEATURES •	Product features an intricately designed 3D metal model building kit. •	The kit consists of detailed laser etching cut onto 2.5 4-inch by 8-inch sheets of thin stainless steel. •	Finished product portrays the Salt Lake City Temple •	Size of finished model: 2.91" x 2.4" x 3.58"
- Size of finished model: 2.91" x 2.4" x 3.58"